When you talk to people about what they love about Steven Universe, the conversation usually touches on the show’s commitment to a diverse cast and crew, its thoughtful portrayals of queerness, and the overall strength of its storytelling. Invariably, though, when people open up about which part of the show really sticks with them, it’s almost always the music. 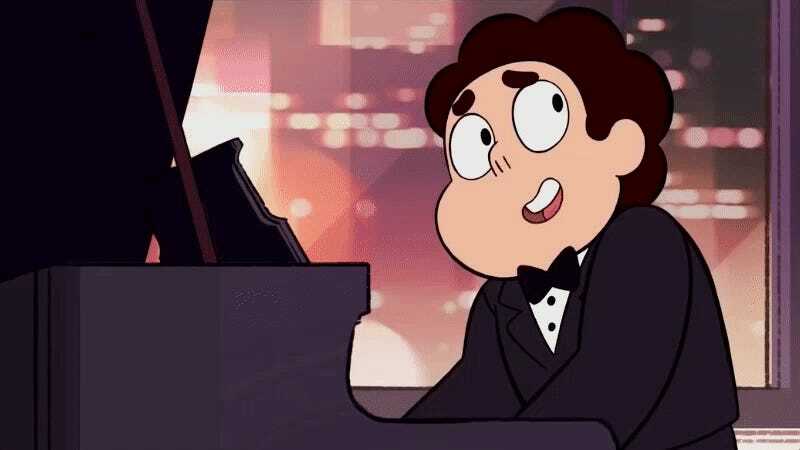 From the moment that Steven Universe’s theme song begins, it’s obvious that, while full blown songs don’t appear in every single episode, there is a foundational musicality to a series as a whole. Songs like “Cookie Cat” and “The Jam Song” reflect the lighthearted whimsy that defined the earlier half of the series. But as Steven Universe’s larger story has unfurled over five seasons, its music has often marked pivotal points in the show’s process of becoming darker, more complex, and mature. Today, the first official Steven Universe soundtrack is dropping on Spotify and iTunes and we had the opportunity to chat with Steven Universe creator Rebecca Sugar about the show and the musical influences that have helped her bring its awesome soundtrack to life. io9: You’ve said that you love musicals. Are there any in particular that you’ve felt have had a strong impact on your song creating process? Rebecca Sugar: For me, The Music Man and Victor/Victoria were two huge influences. You can see references to both of those shows in particular the most strongly in our musical episode “Mr. Greg,” especially in the song “It’s Over.” Aesthetically, that was all very Victor/Victoria-inspired. I love the “Crazy World” sequence where it’s just a pan around Julie Andrews while she sings. It’s incredible because it’s both so simple and so powerful. And of course animated, Golden Age Disney musicals have always been a big influence. Snow White, Sleeping Beauty, Cinderella—I love the sequences in those and how the design, animation, and the music all work together to convey a feeling. What’s the process of creating a new song for the show? Sugar: It’s similar to writing the episodes. When we start, we have a concept, and a character that we want to get from point A to point B and we’ll figure out the story as we’re figuring out the song that needs to be there to support the story. I’m a big believer in songs that progress the characters in the story. I don’t want it there to just be a song for the sake of their being a song. I want it to be a very necessary feeling—something that can only be expressed through song. There’s a quote from Bob Fosse that I just love—I’m going to butcher it, but he basically says that when it’s not enough for a character to just say something they should sing it and when that’s not enough they should dance. It needs to be a feeling so heightened that that’s the only way this person can express it. So when I’m starting, I ask myself what the story is that’s going to make that going to happen. And then once you’ve zeroed in on that feeling? Sugar: When I actually get to writing the song, I’ll get a little more introspective where it’s sort of like “why did I want to tell this story in the first place? What am I trying to tap into here that’s about how I actually feel about something?” Once I can figure out why I wanted to tell a story and where that feeling comes from, that’s when the song comes out. I’ll write a lot of versions of songs that I’ll throw away and it’s usually because I’m writing about the narrative, and it isn’t until I figure out the specific feeling and where it’s coming from for me that the song itself comes out the way I want. 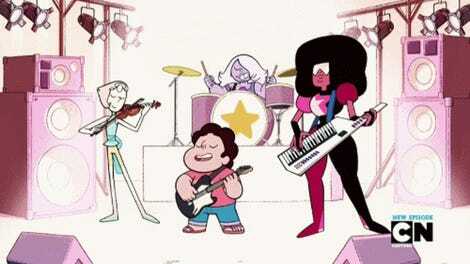 As Steven Universe has grown, have any of the songs helped you more strongly make sense of a who a character is? Sugar: Absolutely. One of the big ones for that was “Stronger Than You.” We’d been waiting to reveal that Garnet has always been a fusion and it was something that she’d been very sensitive and cagey about and her character really shifts once she can be open about who she is to Steven. We get to see what’s going on with her and the song is such an explosion of her celebration of herself, which is where her strength of coming from. We’d always known that she was strong, but we didn’t know why, exactly. And once we could talk about why, we get a chance to explore that. She’d always been caring and had this deep, deep strength. That song it was an exploration of the fact that she’s a victory and a manifestation of love and introducing that song into the show allows her to be able to express that openly. Also, writing the song presented the opportunity to really talk with [Garnet’s voice actor] Estelle about how the song should feel and we got to evolve her character together and that was really interesting, too. As positive and uplifting as songs like “Stronger Than You” are, there are moments where Steven Universe gets, well, somber. How has the music of the show helped you explore some of its heavier themes like unrequited love and loss? Sugar: All of the characters are struggling, but there’s so much beauty in that. They’re struggling with loss and with love, but love is beautiful. The way that they feel is beautiful. That’s where a lot of where my desire to express how all of these feelings are complicated comes from. Even in “Mr. Greg,” Pearl is trying so hard not to be awful and jealous and to be strong about this. But she feels like she’s failing and she’s taking it out on herself and the people around her in that way that I think whenever you take things out on people around you, you’re also doing it to yourself. Everyone reflects you and you reflect everyone. To me, the beauty in that is the ambition you can have to get better—that where even when things start to become bleak, you can have hope. It’s the fact that you can have love and support and family and find beauty in what the situation is in that moment. Even if the situation doesn’t get better, you can better yourself. That’s where I think the optimism can continue to live. You’ve been really big on encouraging young kids to draw and explore their creative selves visually, but what advice do you have for young musicians inspired by your songwriting? Sugar: Everyone, whatever their medium, should express themselves through art as often as possible, as much as possible. I don’t really know a better way to figure out how to know yourself than to put it out on a page or in a song. I would say to kids, don’t worry about skill level. Just any way you can express yourself, if it’s an honest expression it’s going to have so much power. You can have so much skill and incredible training and do something incredibly complicated, but, for me I feel like the value in a piece of art is honesty and I’d rather see a very, very naive, honest piece of art than a highly skilled, lie. Finally, what are you listening to right now? If we pulled up your Spotify what might we find?